One of the most arresting sight in Protégé for me, I have to admit, is Zhang Jing Chu – Hollywood’s next Ziyi Zhang. Trust me, spaghetti straps and cargo pants have never looked better. Another is Louis Koo’s disgusting turn as a drug junkie and all-star jerk. I could not recall Louis looking more convincing in a role and his character provided an interesting counterpoint to Daniel Wu’s morally upright character. 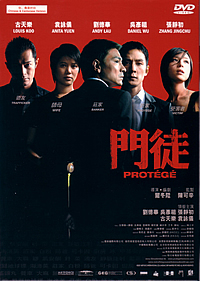 That said, Protégé is not a great movie and has nothing on Derek Yee’s other film, One Night in Mongkok. While the stellar cast discharged their roles well, its overbearing moralistic tone made the film more like a docudrama. Another weak link is the fact that Daniel Wu’s character is an undercover cop. Besides drawing unneeded comparisons with Infernal Affairs (something that afflicts all Hong Kong movies featuring undercover cops these days), the storyline really took much away from the introspective perspective in the movie. If Daniel Wu’s character had been a real gangster who witnessed his girlfriend’s self-destruction by drug consumption, his pain and subsequent betrayal of his boss would better highlight the morality issues in the drug business. But I am neither Derek Yee nor Peter Chan, so here you are. Includes trailers for Protégé, One Last Dance and Twins Mission, as well as the perfunctory Protégé making of. Visual transfer is acceptable and audio selections included English subtitles and Cantonese 5.1.